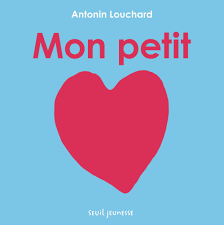 There have been several editions of this timeless Antonin Louchard book, all with the same simple but lovely words and beautiful illustrations. This was one of my son's favourite books when he was little and we both knew it off by heart! Please click here to watch a short video on me introducing this book on my YouTube channel. The story looks very basic and is very easy to understand... but as a teaching aid it is priceless and limitless! This is such a simple and yet such a rich story! There are only 2 or 3 words on each page (eg mon petit agneau) and yet you can exploit it in so many ways. On 1st reading I will get the children to repeat each phrase (choral repetition); on second reading we will ask ourselves what each word on each page means (decoding) and why it is pronounced how it is (if the children are a little bit older at KS2). I will tell them that they are all pet names in France and we will discuss and compare pet names in France and where the children live. The children could then write and illustrate their own books, designed as a class or individually depending on the age and ability. I think this is the perfect book to use around Mothers’ Day or Fathers’ Day because it is about love and affectionate names we use, without directly mentioning mums or dads. The story is so short that the children will quickly memorise the names of the animals (especially as they will think it is funny children should be called things like puce=flea!). It truly is perfect for memorisation skills, culural references and decoding/pronunciation skills too. This book shows, literally, pet names used by adults with children in France. What pet names would be used in the children’s families? Get the children to think about how the French names might or might not literally translate into English. Could they use dictionaries to put their own into French and create their own books or send their pet names, with illustrations, to their French friends if they have them? The children can also learn, thanks to the story, about the special letter "œ", the unique grammar points mentioned below, how to say "I love you" in French... There is so much in it, much more than meets the eye!! introduction to "petit" in the masculine and feminine forms; possessive adjectives "mon/ma"; pronoun "te"; the letter "œ"
I am confident you will love this story!! You can buy the book here at amazon.co.uk. I love Antonin Louchard's work and have written other blogs on books of his, including the hilarious "La promenade de Flaubert". Who is your favourite children's book author? Please share their name in the comments below. They don't have to be able to speak French to get a mention here!